The diagram above shows how the Cumulus Linux 3.4 HTTP API can be extended to include the functionality described in REST API for Cumulus Linux ACLs. 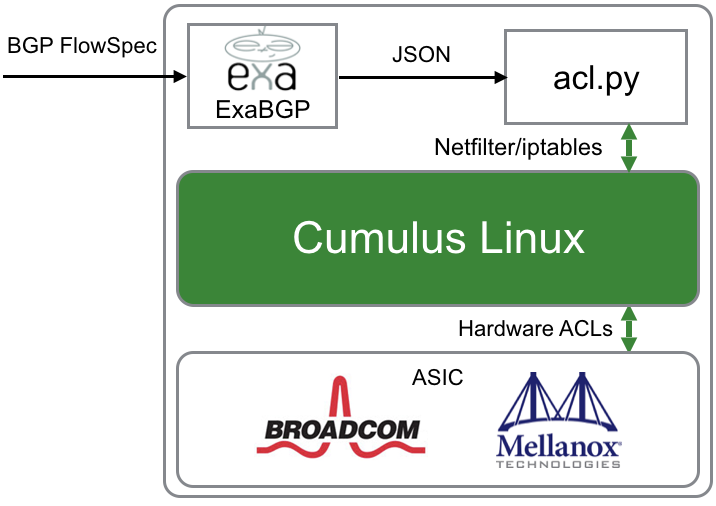 Fast programmatic control of Cumulus Linux ACLs addresses a number of interesting use cases, including: DDoS mitigation, Elephant flow marking, and Triggered remote packet capture using filtered ERSPAN. The Github pphaal/acl_server project INSTALL page describes how to install the acl_server daemon and configure the NGINX web server front end for the Cumulus Linux REST API to include the acl_server functions. The integration ensures that the same access controls configured for the REST API apply to the acl_server functions, which appear under the /acl/ path. The following examples demonstrate the REST API. This iptables rule blocks all traffic from UDP port 53 (DNS) to host 10.10.100.10. This is the type of rule that might be inserted to block a DNS amplification attack. "-A FORWARD --in-interface swp+ -d 10.10.100.10 -p udp --sport 53 -j DROP"
Note: this doesn't delete all the ACLs, just the ones created using the REST API. All default ACLs or manually created ACLs are inaccessible through the REST API. Warning: 199 - "check lasterror"
The REST API is intended to be used by automation systems and so syntax problems with the ACLs they generate should be rare and are the result of a software bug. A controller using this API should check responses for the presence of the last error Warning, log the lasterror information so that the problem can be debugged, and finally delete all the rules created through the REST API to restore the system to its default state. While this REST API could be used as a convenient way to manually push an ACL to a switch, the API is intended to be part of automation solutions that combine real-time traffic analytics with automated control. Cumulus Linux includes standard sFlow measurement support, delivering real-time network wide visibility to drive solutions that include: DDoS mitigation, enforcing black lists, marking large flows, ECMP load balancing, packet brokers etc. 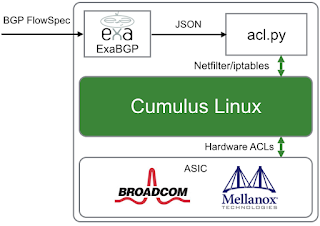 The acl_server functionality demonstrates the value of the open Linux environment exposed by Cumulus Linux, making it easy to extend the platform using standard Linux tools in order to address operational requirements. Download the free Cumulus Linux VX virtual machine to try these examples yourself. Real-time Wifi-Traffic Heatmap (source code GitHub: cod3monk/showfloor-heatmap) displays real-time WiFi traffic from SC17 (The International Conference for High Performance Computing, Networking, Storage and Analysis, November 12-17, 2017). Click on the link to see live data. The Cisco Wireless access points in the conference network don't currently support sFlow, however, the access points are connected to Juniper EX switches which stream sFlow telemetry to an instance of sFlow-RT analytics software that provides real-time usage metrics for the heat map. Wireless describes the additional visibility delivered by sFlow capable wireless access points, including: air time, channel, retransmissions, receive / transmit speeds, power, signal to noise ratio, etc. With sFlow enabled wireless access points, additional information could be layered on the heat map. The sFlow.org web site lists network products and vendors that support the sFlow standard. Arista EOS® CloudVision® provides a centralized point of visibility, configuration and control for Arista devices. The CloudVision controller is available as a virtual machine or physical appliance. Fabric Visibility on Arista EOS Central describes how to use industry standard sFlow instrumentation in Arista switches to deliver real-time flow analytics. This article describes the steps needed to integrate flow analytics into CloudVision. echo "configure and run cvp-eapi-topology.py"
Note: The script needs to be run any time the physical topology changes, or you can run the script periodically using cron. 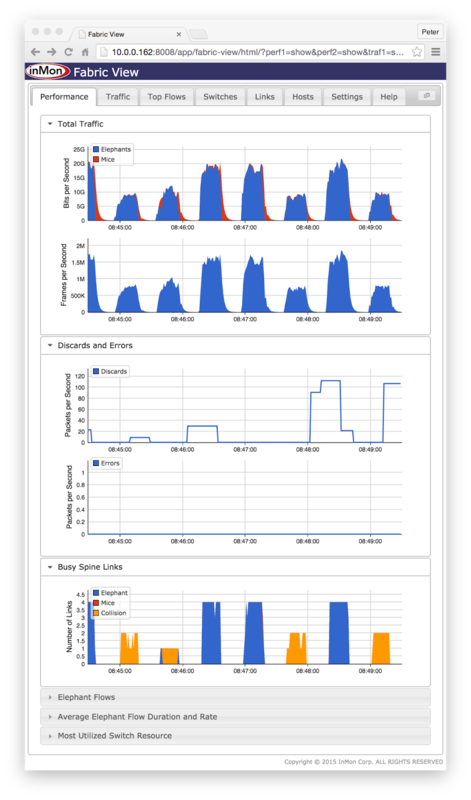 Optionally, follow the steps in Arista EOS telemetry to enhance the sFlow telemetry stream from the switches with detailed CPU, memory, disk, and host network statistics. Finally, access the Fabric View web interface at https://cloudvision/sflow-rt/ using your CloudVision login credentials. Fabric View is an open source application running on top of the sFlow-RT analytics engine. The Fabric View software can easily be modified to add new capabilities, e.g. Black hole detection. A number of applications are available for sFlow-RT. Writing Applications describes how to use sFlow-RT's APIs to extend or modify existing applications or develop new applications. In addition, there are also many sFlow-RT related articles on this blog. For example, Arista eAPI describes how to automatically push controls based on flow measurements, describing automated DDoS mitigation as a use case. Other use cases include: traffic engineering, traffic accounting, anomaly detection, intrusion detection, FIB optimization, targeted packet capture etc. Many of the examples on this blog describe network visibility driven control of data center networks. However, campus networks face many similar challenges and the availability of industry standard sFlow telemetry and RESTful control APIs in campus switches make it possible to apply feedback control. This article presents an example of implementing quota controls using HPE Aruba switches. Typically, a small number of hosts are responsible for the majority of traffic on the network: identifying those hosts, and applying controls to their traffic to prevent them from unfairly dominating, ensures fair access to all users. P2P protocols make use of very large numbers of connections in order to quickly transfer data. The large number of connections allows a P2P user to obtain a disproportionate amount of network bandwidth; even a small number of P2P users (less than 0.5% of users) can consume over 90% of the network bandwidth. P2P protocols (and users) are very good at getting through access control lists (acl) by using non-standard ports, using port 80 (web) etc. Trying to maintain an effective filter to identify P2P traffic is a challenge and the resulting complex rule sets consume significant resources in devices attempting to perform classification. In this example, all switches are configured to stream sFlow telemetry to an instance of the sFlow-RT real-time sFlow analyzer running a quota controller. When a host exceeds its traffic quota, a REST API call is made to the host's access switch, instructing the switch to mark the host's traffic as low priority. Marking the traffic ensures that if congestion occurs elsewhere in the network, typically on the Internet access links, priority queuing will cause marked packets can be dropped, reducing the bandwidth consumed by the marked host. The quota controller continues to monitor the host and the marking action is removed when the host's traffic returns to acceptable levels. A simple usage quota is easy to maintain and enforce and encourages users to be more responsible in their use of shared resources. Since quota based controls are interested in the overall amount of traffic that a host generates and not the specific type of traffic, they don't encourage users to tailor P2P application setting to bypass access control rules and so their traffic is easier to monitor. A quota system can be implemented using standard network hardware, without the addition of a "traffic shaping" appliance that can become a bottleneck and point of failure. Writing Applications provides an overview of the sFlow-RT scripting API. HPE ArubaOS-Switch REST API and JSON Schema Reference Guide 16.03 describes the REST API calls in the runCmds() function. The groups variable defines groups of IP addresses, identifying external addresses (ext), addresses included as candidates for the quota controller (inc), and addresses excluded from quota controls (exc). Defining Flows describes the arguments to the setFlow() function. In this case, calculating a 10 second moving average of traffic from local sources (inc) to external destinations (ext). The setThreshold() function creates a threshold that triggers if the moving average of traffic from an address exceeds 10Mbit/s. The thresholds are only applied to 10M, 100M and 1G access ports, ensuring that controls are only applied to access layer switches and not to 10G ports on aggregation and core switches. The setEventHandler() function processes the events, keeping track of existing controls and implementing new DSCP marking rules. The setIntervalHandler() function runs periodically and removes marking rules when they are not longer required (after the threshold timeout has expired). The ArubaOS commands to add / remove DSCP marking for the host are highlighted in blue. The output indicates that a control marking traffic from 10.0.0.70 was added to edge switch 10.0.0.232 and removed just over 30 seconds later. The screen capture using Flow Trend to monitor the core switches shows the controller in action. The marking rule is added as soon as traffic from 10.0.0.70 exceeds the 10Mbps quota for 10 seconds (the DSCP marking shown in the chart changes from red be(0) to blue af11(10)). The marking rule is removed once the traffic returns to normal. The quota settings in the demonstration were aggressive. In practice the threshold settings would be higher and the timeouts longer in order to minimize control churn. The trend above was collected from a university network of approximately 20,000 users that implemented a similar control scheme. 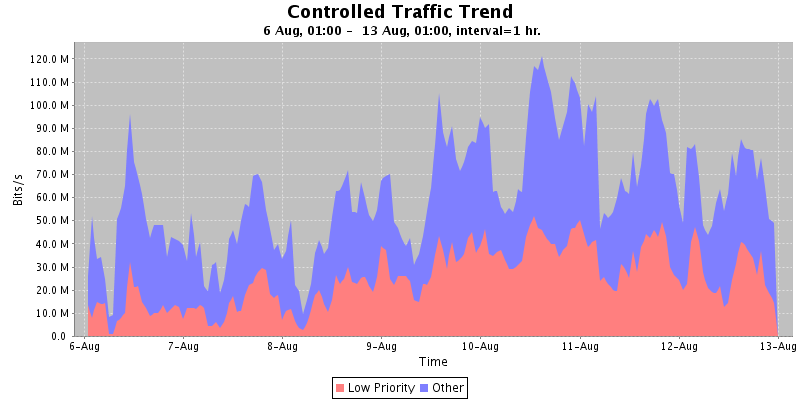 In this case, the quota controller was able to consistently mark 50% of the traffic as low priority. Between 10 and 20 controls were in place at any given time and the controller made around 10 control changes an hour (adding or removing a control). During busy periods, congestion on the campus Internet access links was eliminated since marked traffic could be discarded when necessary. Real-time measurement and programmatic APIs are becoming standard features of campus switches, allowing visibility driven automatic control to adapt the network to changing network demands and security threats. 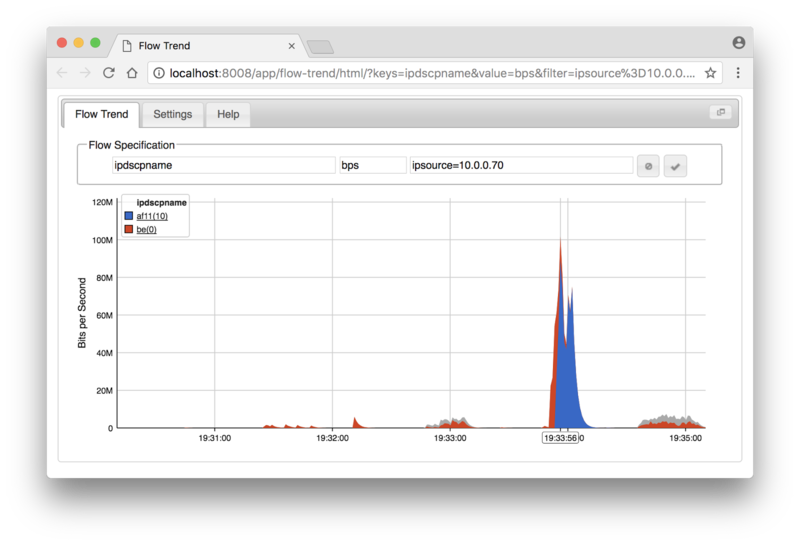 The open source sflow-rt/flow-trend project displays a real-time trend chart of network traffic that updates every second. Defining Flows describes how to break out traffic by different traffic attributes, including: addresses, ports, VLANs, protocols, countries, DNS names, etc. The simplest way to run the software is using the docker. Configure network devices to send standard sFlow telemetry to Flow Trend. Access the web user interface on port 8008. 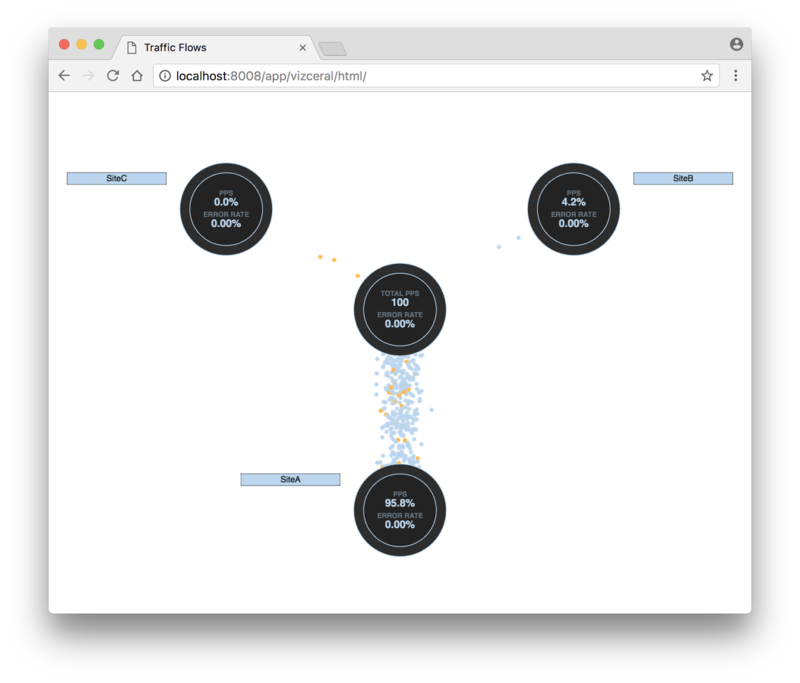 The open source sflow-rt/vizceral project demonstrates how real-time sFlow network telemetry can be presented using Netflix Vizceral. The central dot represents the Internet (all non-local addresses). The surrounding dots represents addresses grouped into sites, data centers, buildings etc. The animated particle flows represent packet flows with colors indicating packet type: TCP/UDP shown in blue, ICMP shown in yellow, and all other traffic in red. Click on a node to zoom in to show packets flowing up and down the protocol stack. Press the ESC key to unzoom. 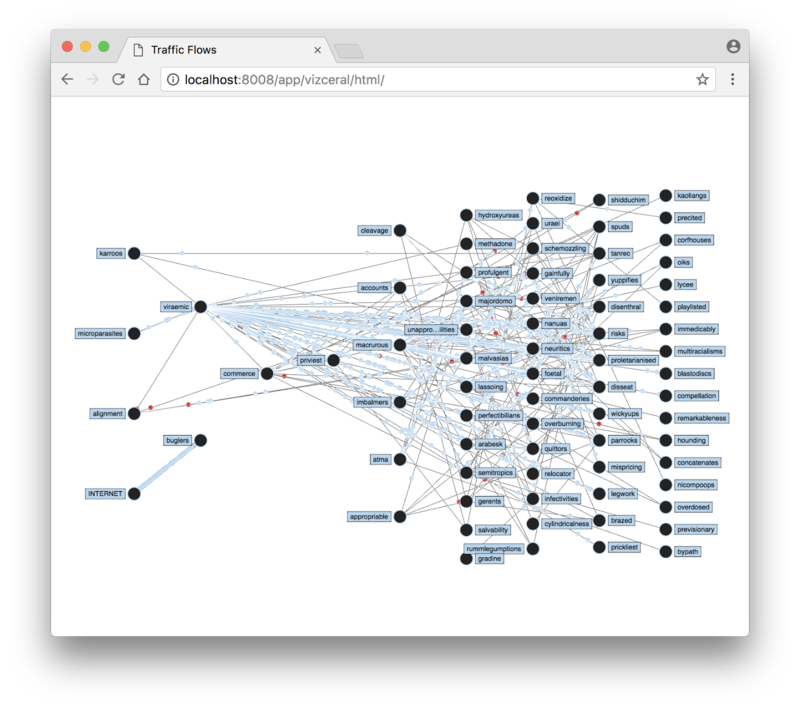 In this case, the detailed view shows messages flowing between microservices running in the Amazon public cloud. Similar visibility could be obtained by deploying Host sFlow agents with associated modules for web and application servers and modifying sflow/vizceral to present the application transaction flows. In private data centers, sFlow support in load balancers (F5, A10) provides visibility into interactions between application tiers. See Microservices for more information on using sFlow to instrument microservice architectures. Collecting Docker Swarm service metrics describes how meta data about services running on Docker Swarm can be combined with sFlow telemetry to generate service level metrics. A similar approach could be taken to display Docker Swarm service interactions using Vizceral. Using network visibility to measure flows between services greatly simplifies the monitoring task, avoiding the challenge of adding instrumentation to each container. Introducing data center fabric, the next-generation Facebook data center network describes the benefits of moving to a leaf and spine network architecture. The diagram shows how the leaf and spine architecture creates many paths between each pair of hosts. Multiple paths increase available bandwidth and resilience against the loss of a link or a switch. 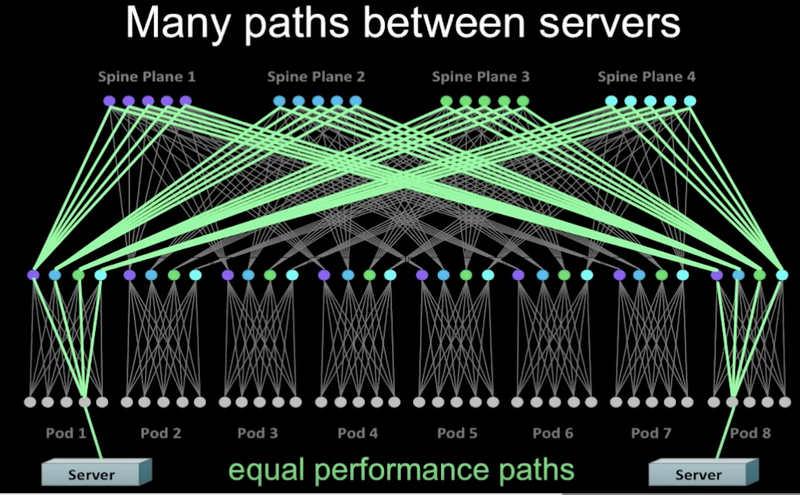 While most networks don't have the scale requirements of Facebook, smaller scale leaf and spine designs deliver high bandwidth, low latency, networking to support cloud workloads (e.g. vSphere, OpenStack, Docker, Hadoop, etc.). 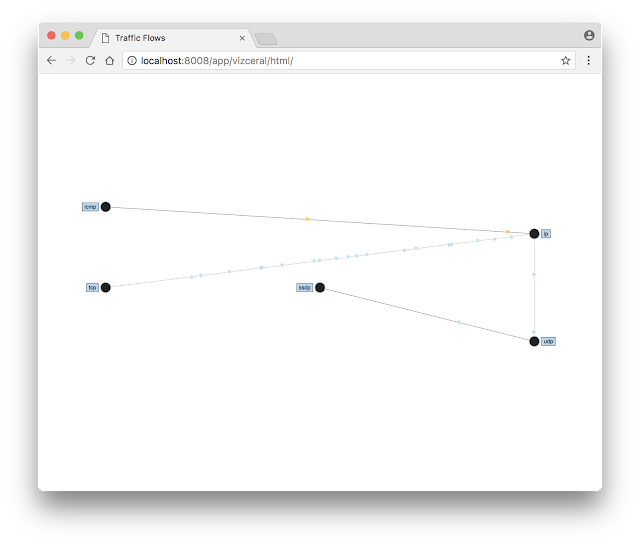 Unlike traditional hierarchical network designs, where a small number of links can be monitored to provide visibility, a leaf and spine network has no special links or switches where running CLI commands or attaching a probe would provide visibility. Even if it were possible to attach probes, the effective bandwidth of a leaf and spine network can be as high as a Petabit/second, well beyond the capabilities of current generation monitoring tools. Fortunately, industry standard sFlow monitoring technology is built into the commodity switch hardware used to build leaf and spine networks. 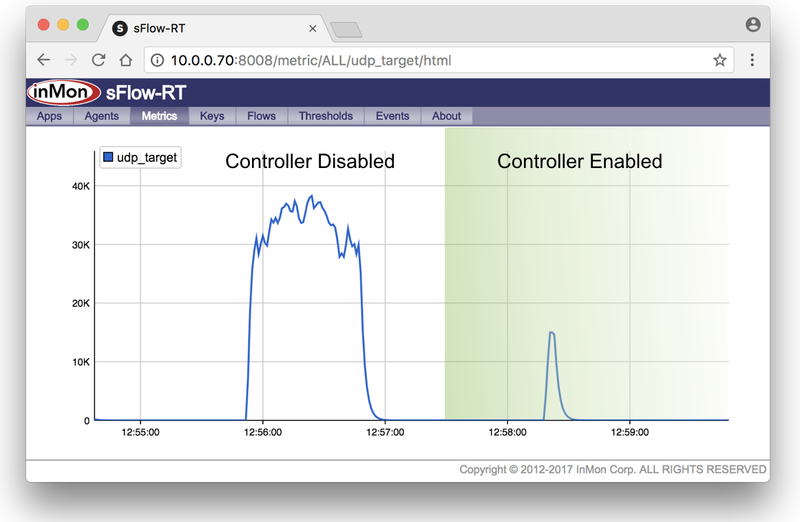 Enabling sFlow telemetry on all the switches in the network provides centralized, real-time, visibility into network traffic. Fabric View describes an open source application running on the sFlow-RT real-time analytics engine. The Fabric View application provides an overview of the health of the entire leaf and spine fabric, tracking flows and counters on all links and summarizing information in a set of fabric level metrics and dashboards. In addition, Black hole detection describes how to detect routing anomalies in the fabric using the forwarding information included in the sFlow telemetry stream. The sFlow sampling mechanism implemented in the switches is a highly scaleable method of passively collecting traffic information. However, analyzing failed connections can be a challenge since very few packets are generated and the chance of sampling these packets is small. The traditional tools used to diagnose connectivity issues, ping and traceroute, are of limited value in a leaf and spine network since they only test a single path and are likely to miss the path that is experiencing difficulties. 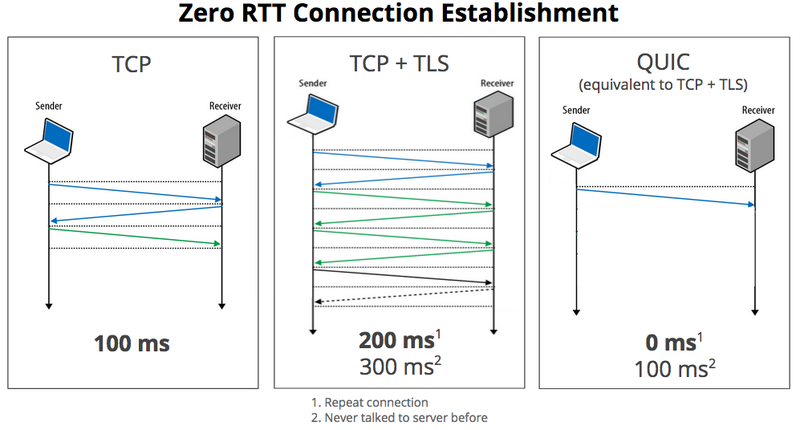 An alternative method of addressing the multi-path tracing problem is to enable filtered packet capture on each switch, programming the filters to capture the packets of interest. However, this method can be slow and complex since every switch needs to be configured for each test and the switch configurations need to be cleared after the test has been completed. Note: See RESTflow for a description of the sFlow-RT REST API. Note: Identifying characteristics of failed connections may be inferable from application error logs. Otherwise, running packet capture on the affected host (tcpdump/wireshark) can identify the network attributes of interest. Note: The above command sends 100,000 packets at a rate of 1 packet every 100 microseconds (i.e. at a rate of 10,000 packets per second). 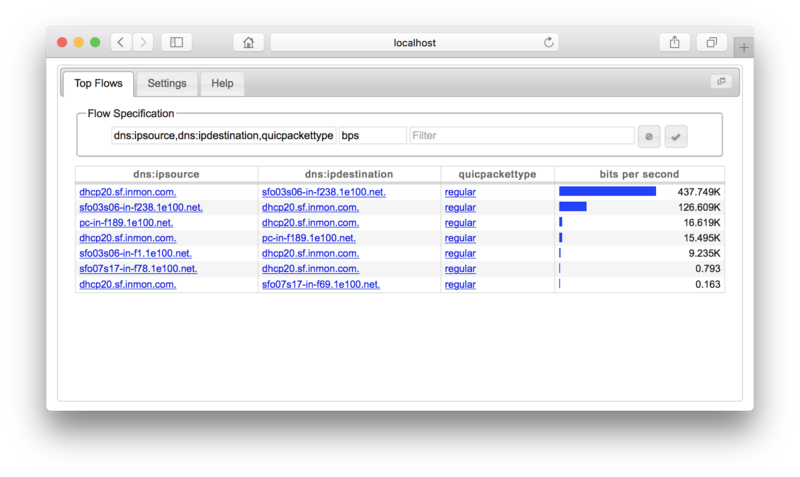 Select a packet rate that will not disturb production traffic on the network and make sure to send enough packets so that at least one packet will be sampled on each link. For example, for 10G links the packet sampling rate should be around 1-in-10,000 so generating 100,000 packets means that there is a 99.995% chance that a link carrying the flow will generate at least 1 sample (the probability is easily calculated using the Binomal distribution, see Wolfram Alpha). The above example traced the single path traversed by a specific connection. To explore all paths, drop the source port and hping3 will cycle through source ports and the traffic should be visible on all the equal cost paths (provided that a layer 4 hash function has been selected by the switches). Continuous network-wide monitoring of leaf and spine networks using sFlow leverages the capabilities of commodity switch hardware and provides centralized visibility that simplifies network operation and trouble shooting. The latest Cumulus Linux 3.4 release include a REST API. This article will demonstrate how the REST API can be used to automatically deploy traffic controls based on real-time sFlow telemetry. 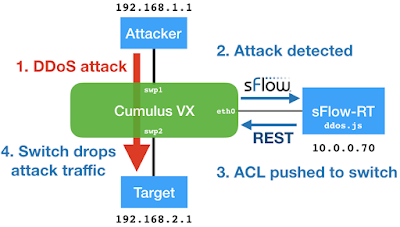 DDoS mitigation with Cumulus Linux describes how sFlow-RT can detect Distributed Denial of Service (DDoS) attacks in real-time and deploy automated controls. This solution can be tested using freely available software. The setup shown at the top of this article was constructed using a Cumulus VX virtual machine running on VirtualBox. The Attacker and Target virtual machines are Linux virtual machines used to simulate the DDoS attack. 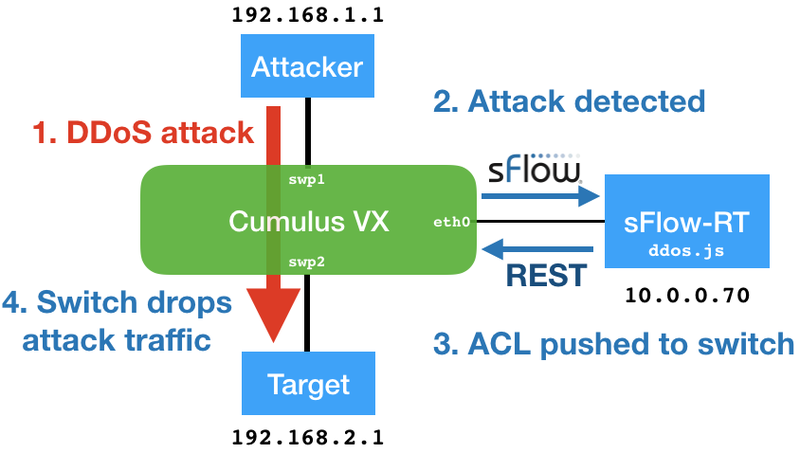 REST API for Cumulus Linux ACLs describes the acl_server daemon that was used in the original article. The acl_server daemon is optimized for real-time performance, supporting use cases in which multiple traffic controls need to be quickly added and removed, e.g DDoS mitigation, marking large flows, ECMP load balancing, packet brokers. 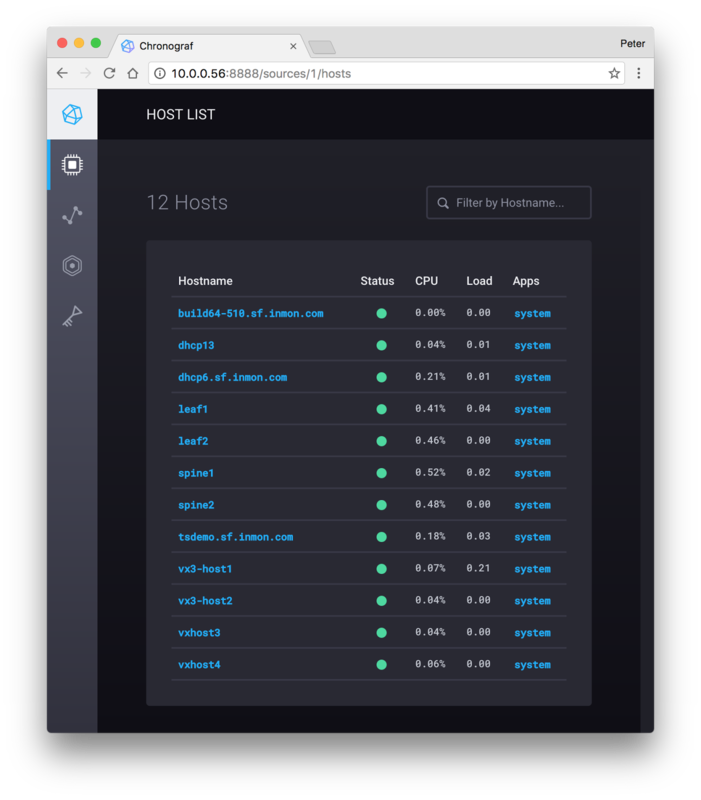 A key benefit of the openness of Cumulus Linux is that you can install software to suite your use case, other examples include: BGP FlowSpec on white box switch, Internet router using Cumulus Linux, Topology discovery with Cumulus Linux, Black hole detection, and Docker networking with IPVLAN and Cumulus Linux. PSAMPLE_ATTR_IIFINDEX input Interface packet was received on. PSAMPLE_ATTR_OIFINDEX output Interface packet was sent on. PSAMPLE_ATTR_SAMPLE_GROUP data source The location within network device that generated packet sample. PSAMPLE_ATTR_SAMPLE_RATE sampling_rate The Sampling Rate specifies the ratio of packets observed at the Data Source to the samples generated. For example a sampling rate of 100 specifies that, on average, 1 sample will be generated for every 100 packets observed. Linux is widely used for switch network operating systems, including: Arista EOS, Cumulus Linux, Dell OS10, OpenSwitch, SONiC, and Open Network Linux. The adoption of Linux by network vendors and cloud providers is driving increased support for switch hardware by the Linux kernel community. Hardware support for sFlow packet sampling is widely implemented in switch ASICs, including: Broadcom, Mellanox, Intel, Marvell, Barefoot Networks, Cavium, and Innovium. 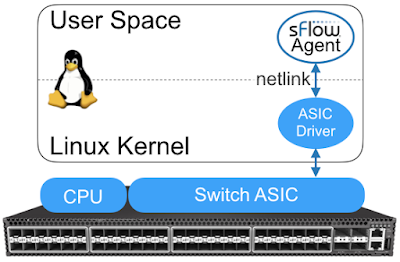 A standard Linux interface to ASIC sampling simplifies the implementation of sFlow agents (e.g. Host sFlow) and ensures consistent behavior across hardware platforms to deliver real-time network-wide visibility using industry standard sFlow protocol. 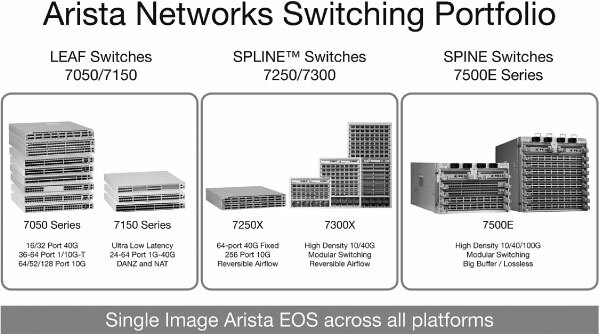 The sFlow and eAPI features of EOS (Extensible Operating System) are standard across the full range of Arista Networks switches. This article demonstrates how the real-time visibility provided by sFlow telemetry can be combined with the programmatic control of eAPI to automatically adapt the network to changing traffic conditions. 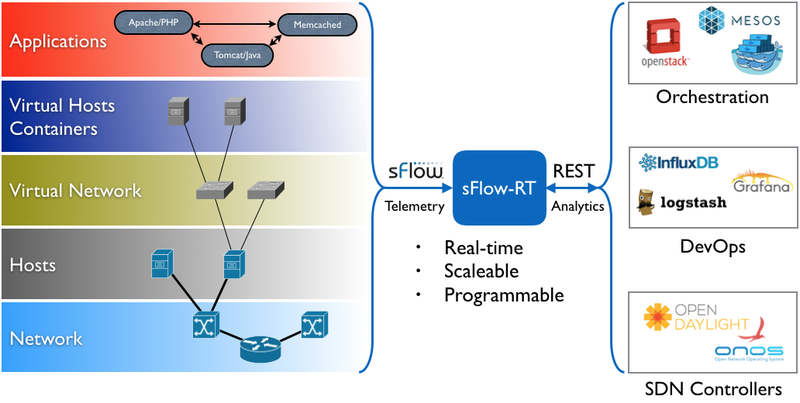 In the diagram, the sFlow-RT analytics engine receives streaming sFlow telemetry, provides real-time network-wide visibility, and automatically applies controls using eAPI to optimize forwarding, block denial of service attacks, or capture suspicious traffic. While retrieving information from the switch is useful, reconfiguring the switch based on real-time sFlow telemetry is much more interesting. The script is designed to work with a large number of switches, automatically applying the DirectFlow filter to the switch reporting the traffic. The udp_target flow identifies the IP address targeted by the attack and the UDP source port of service being used to reflect/amplify traffic. A threshold of 1,000,000 frames per second is used to trigger an event. The setEventHandler function extracts target IP address, and UDP source port from the event and uses eAPI to push a DirectFlow filter to switch (agent) identified in the event. The setIntervalHandler function is responsible for removing controls after 60 minutes. The script can easily be modified to use eAPI to gather additional metadata. For example, to identify leaf switches and limit filters to the edge of the network. Exporting events using syslog shows how notifications can be sent to SIEM tools, e.g. Splunk, Logstash, etc. 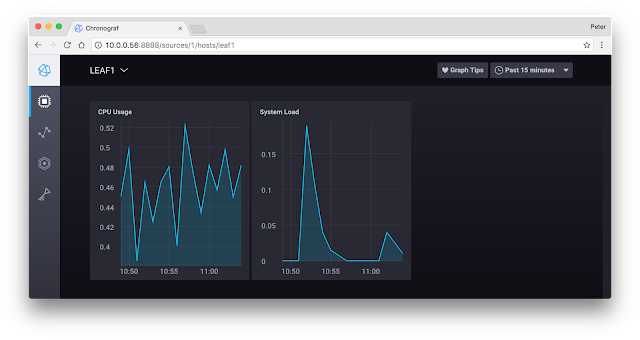 InfluxDB and Grafana, Metric export to Graphite, Cloud analytics, and SignalFx, demonstrate how metrics can be pushed to local and/or cloud-based dashboards. See Writing Applications for more information on sFlow-RT scripting and APIs. The basic steps of defining a flow, setting a threshold, and then acting on events embodied in this example provide a general framework that can be applied to a wide variety of use cases: SDN and large flows, Marking large flows, SDN packet broker etc. In addition to DirectFlow, other useful EOS eAPI controls include: ACLs, route maps, static routes, null routes, packet capture etc. Industry standard sFlow telemetry unlocks the full potential of programmable networking platforms such as Arista EOS, providing the visibility required to automatically target controls and adapt the network in real-time to changing network conditions to increase performance, reduce cost, and improve security. 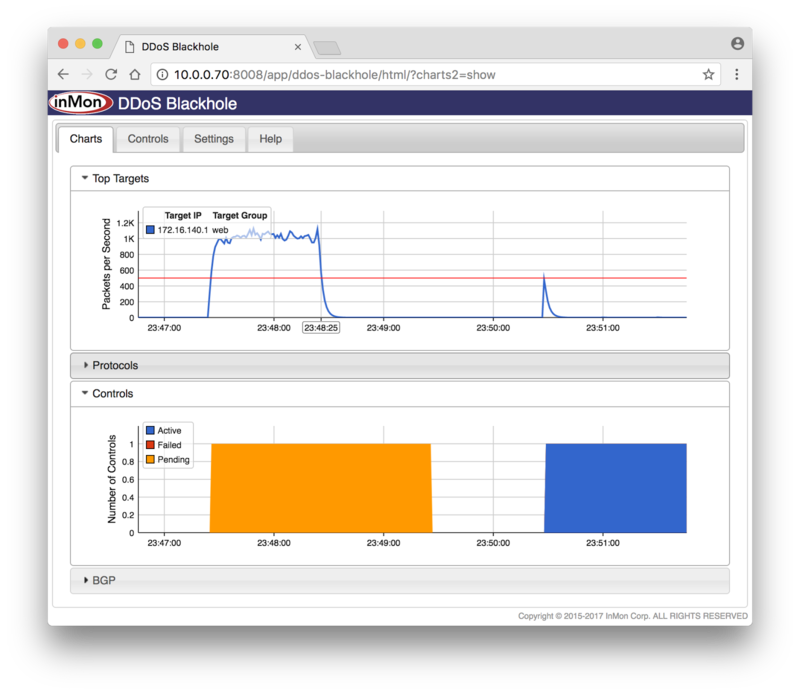 Remotely Triggered Black Hole (RTBH) Routing describes how native BGP support in the sFlow-RT real-time sFlow analytics engine can be used to blackhole traffic in order to mitigate a distributed denial of service (DDoS) attack. Black hole routing is effective, but there is significant potential for collateral damage since ALL traffic to the IP address targeted by the attack is dropped. 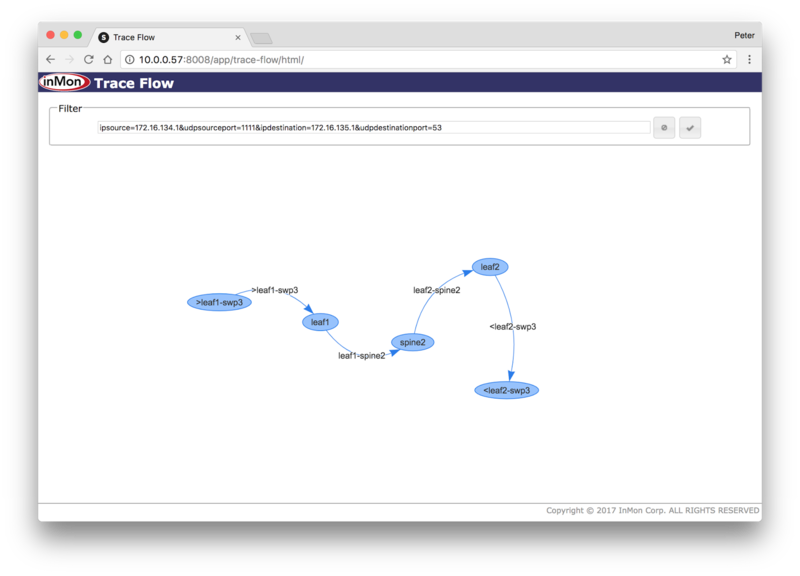 The BGP FlowSpec extension (RFC 5575: Dissemination of Flow Specification Rules) provides a method of transmitting traffic filters that selectively block the attack traffic while allowing normal traffic to pass. BGP FlowSpec support has recently been added to sFlow-RT and this article demonstrates the new capability. This demonstration uses the test network described in Remotely Triggered Black Hole (RTBH) Routing. The network was constructed using free components: VirtualBox, Cumulus VX, and Ubuntu Linux. BGP FlowSpec on white box switch describes how to implement basic FlowSpec support on Cumulus Linux. The screen capture shows the results. The left of the chart shows a simulated attack without mitigation. The attack reaches a sustained rate 30,000 packets per seconds. The right half of the chart shows an attack with automatic mitigation enabled. The target IP address and UDP source port associated with the amplification attack are immediately identified and a BGP FlowSpec filter is pushed to the upstream service provider router, sp-router, where the attack traffic is immediately dropped. BGP FlowSpec is a method of distributing access control lists (ACLs) using the BGP protocol. Distributed denial of service (DDoS) mitigation is an important use case for the technology, allowing a targeted network to push filters to their upstream provider to selectively remove the attack traffic. Unfortunately, FlowSpec is currently only available on high end routing devices and so experimenting with the technology is expensive. Looking for an alternative, Cumulus Linux is an open Linux platform that allows users to install Linux packages and develop their own software. This article describes a proof of concept implementation of basic FlowSpec functionality using ExaBGP installed on a free Cumulus VX virtual machine. The same solution can be run on inexpensive commodity white box hardware to deliver terabit traffic filtering in a production network. acl = "[iptables]\n-A FORWARD --in-interface swp+"
acl = acl + " -j DROP\n"
Note: This script is a simple demonstration of the concept that has significant limitations: there is no error handling, the only action is to drop traffic, and FlowSpec comparison operators are ignored. 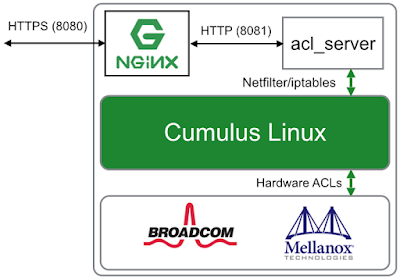 The script is is based on the article RESTful control of Cumulus Linux ACLs. "string": "flow destination-ipv4 192.168.0.1/32 protocol =udp source-port =123"
The attack traffic is now dropped by the switch. In a hardware switch, this entry would be pushed by Cumulus Linux into the hardware, filtering the traffic at line rate to provide Terabit traffic filtering. The screen shot demonstrates real-time distributed denial of service (DDoS) mitigation. Automatic mitigation was disabled for the first simulated attack (shown on the left of the chart). The attack reaches a sustained packet rate of 1000 packets per second for a period of 60 seconds. Next, automatic mitigation was enabled and a second attack launched. This time, as soon as the traffic crosses the threshold (the horizontal red line), a BGP remote trigger message is sent to router, which immediately drops the traffic. The diagram shows the test setup. The network was built out of freely available components: CumulusVX switches and Ubuntu 16.04 servers running under VirtualBox. The ce-router peers with the upstream service provider router (sp-router 172.16.141.2) as well as with sFlow-RT. A route-map is used to filter updates from sFlow-RT (10.0.0.70), matching the well-known blackhole community 65535:666, and setting the null route next-hop 192.0.2.1. The route-map also ensures that only /32 prefixes are accepted. In production, the route-map should also filter out the addresses of critical infrastructure (router IP addresses etc.). An additional route-map will typically be required to select the blackhole routes to propagate upstream, re-mapping the community to meet the upstream service provider's policy, e.g. Hurricane Electric uses community 6939:666. In addition, the ce-router is configured to send sFlow to the controller (10.0.0.70), see Switch configurations. The groups identify addresses that are external (possible attackers) and local (possible targets). By default, traffic to the external, private, multicast and exclude groups will not trigger actions. Any additional group names, in this case web, are blackhole candidates. Note: Only traffic from the external group to backhole candidate groups (web) is shown on the Charts tab (and considered for DDoS detection and mitigation). The screen capture at the top of this article shows that the time between the attack being launched and successfully blocked is just a few of seconds. Arista EOS switches support industry standard sFlow telemetry, enabling hardware instrumentation supported by merchant silicon to export hardware interface counters and flow data. The latest release of the open source Host sFlow agent has been ported to EOS, augmenting the telemetry with standard host CPU, memory, and disk IO metrics. Linux as a Switch Operating System: Five Lessons Learned identifies benefits of using Linux as the basis for EOS. In this context, the Linux operating system made it easy to port the Host sFlow agent, use standard Linux package management (RPM Package Manager), and gather metrics using standard Linux APIs. A new eAPI module automatically synchronizes the Host sFlow daemon with the EOS sFlow configuration. There are a number of additional open source and commercial sFlow collectors available. For example, the diagram shows how new and existing cloud based or locally hosted orchestration, operations, and security tools can leverage the sFlow-RT analytics service to gain real-time visibility. 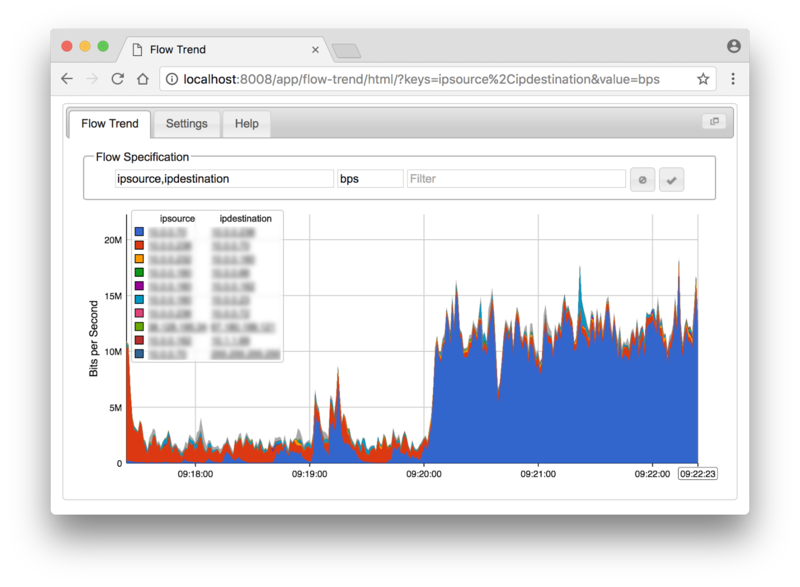 The host metrics should immediately begin to be received at the sFlow collector. Maximum Performance from Acropolis Hypervisor and Open vSwitch describes the network architecture within a Nutanix converged infrastructure appliance - see diagram above. This article will explore how the Host sFlow agent can be deployed to enable sFlow instrumentation in the Open vSwitch (OVS) and deliver streaming network and system telemetry from nodes in a Nutanix cluster. This article is based on a single hardware node running Nutanix Community Edition (CE), built following the instruction in Part I: How to setup a three-node NUC Nutanix CE cluster. 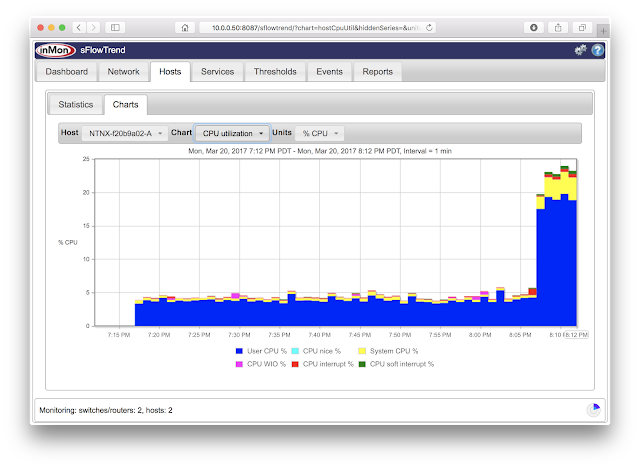 If you don't have hardware readily available, the article, 6 Nested Virtualization Resources To Get You Started With Community Edition, describes how to run Nutanix CE as a virtual machine. The sFlow standard is widely supported by network equipment vendors, which combined with sFlow from each Nutanix appliance, delivers end to end visibility in the Nutanix cluster. The following screen captures from the free sFlowTrend tool are representative examples of the data available from the Nutanix appliance. The Network > Top N chart displays the top flows traversing OVS. In this case an HTTP connection is responsible for most of the traffic. Inter-VM and external traffic flows traverse OVS and are efficiently monitored by the embedded sFlow instrumentation. The Hosts > CPU utilization chart shows an increase in CPU utilization due to the increased traffic. The Hosts > Disk IO shows the Write operations associated with connection. First log into the Nutanix host as root. Data will immediately start to appear in sFlowTrend. A QUIC update on Google’s experimental transport describes some of the benefits of the QUIC (Quick UDP Internet Connections) protocol that is now the default transport when Google's Chrome browser connects to Google services (gmail, search, etc.). Given the over 50% market share of the Chrome browser (NetMarketShare) and the popularity of Google services, it is important to be aware of the QUIC protocol and to start tracking its use of network resources. An easy way to see if you have any QUIC traffic on your network is to use the standard sFlow instrumentation built into network switches. 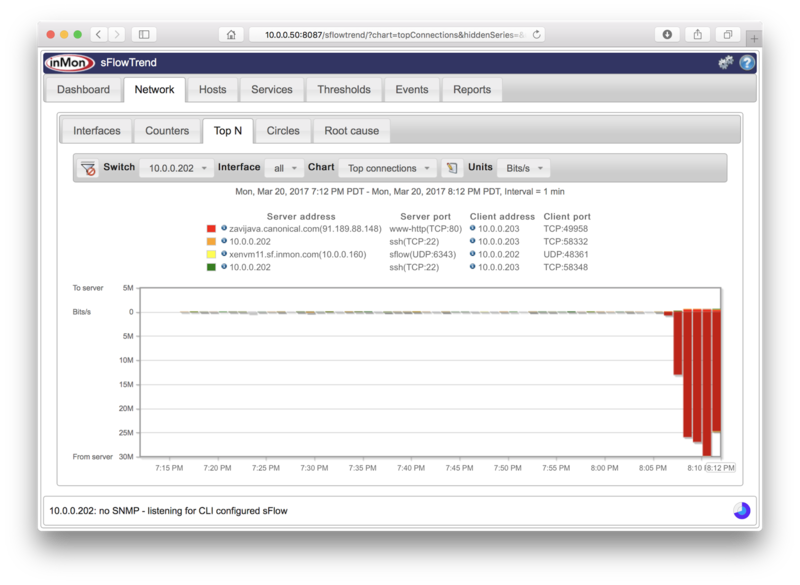 Configure the switches to send sFlow telemetry to an sFlow collector for visibility into network traffic. Note: Real-time domain name lookups describes how sFlow-RT incorporates DNS (Domain Name Service) requests in its real-time analytics pipeline so that traffic flows can be identified by domain name. The resulting top flows table is shown in the screen capture above. The Google addresses are identifiable by the 1e100.net domain names (What is 1e100.net?) and it appears that all the traffic is flowing to or from Google services (as one would expect). However, it would be nice to be able to be notified of QUIC traffic that is not associated with Google since this could represent a threat. Note: Writing Applications gives an overview of sFlow-RT's embedded script API. The script logs events. The article Exporting events using syslog shows how the script could be modified export events via syslog to SIEM tools such as Logstash and Splunk. The InfluxData TICK (Telegraf, InfluxDB, Chronograf, Kapacitor) provides a full set of integrated metrics tools, including an agent to export metrics (Telegraf), a time series database to collect and store the metrics (InfluxDB), a dashboard to display metrics (Chronograf), and a data processing engine (Kapacitor). Each of the tools is open sourced and can be used together or separately. 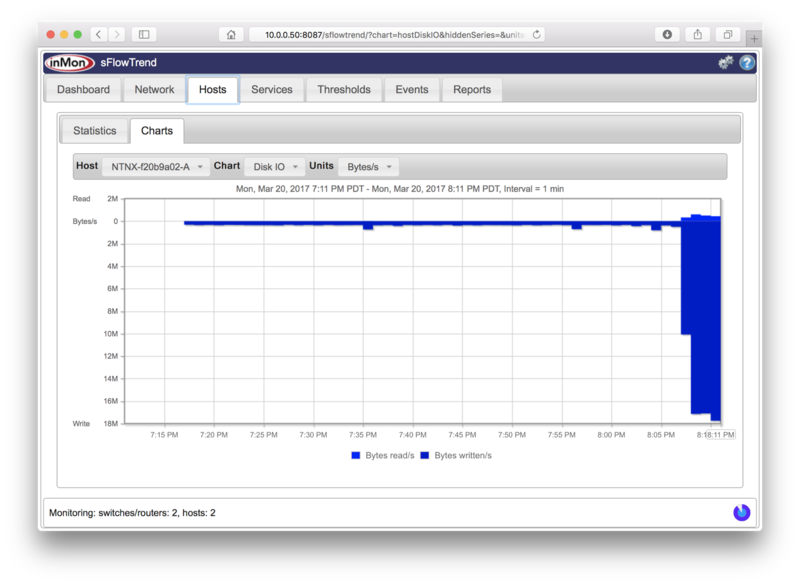 This article will show how industry standard sFlow agents embedded within the data center infrastructure can provide Telegraf metrics to InfluxDB. The solution uses sFlow-RT as a proxy to convert sFlow metrics into their Telegraf equivalent form so that they are immediately visible through the default Chronograf dashboards (Using a proxy to feed metrics into Ganglia described a similar approach for sending metrics to Ganglia). The sentToInfluxDB() function uses the Writing data using the HTTP API to POST metrics to InfluxDB. The setIntervalHandler function retrieves a table of metrics from sFlow-RT every 15 seconds and formats them to use the same names and tags as Telegraf. The script implements Telegraf System and CPU plugin functionality. Additional metrics can easily be added to proxy additional Telegraf plugins. Writing applications provides an overview of the sFlow-RT APIs. Pre-processing the metrics using sFlow-RT's real-time streaming analytics engine can greatly increase scaleability by selectively exporting metrics and calculating higher level summary statistics in order to reduce the amount of data logged to the time series database. The analytics pipeline can also augment the metrics with additional metadata. For example, Collecting Docker Swarm service metrics demonstrates how sFlow-RT can monitor dynamic service pools running under Docker Swarm and write summary statistics to InfluxDB. In this case Grafana was used to build metrics dashboard instead of Chronograf. The open source Host sFlow agent exports an extensive range of standard sFlow metrics and has been ported to a wide range of platforms. Standard metrics describes how standardization helps reduce operational complexity. The overlap between standard sFlow metrics and Telegraf base plugin metrics makes the task of proxying straightforward. The Host sFlow agent (and sFlow agents embedded in network switches and routers) goes beyond simple metrics export to provide detailed visibility into network traffic and articles on this blog demonstrate how sFlow-RT analytics software can be configured to generate detailed traffic flow metrics that can be streamed into InfluxDB, logged (e.g. Exporting events using syslog), or trigger control actions (e.g. DDoS mitigation, Docker 1.12 swarm mode elastic load balancing).